In a bid to bolster his faith, Pastor Enoch Adeboye had once fasted intensely and prayed for God to grant his request. Adeboye revealed this on the second day of the ongoing Holy Ghost Congress of the Church at its Redemption Camp, along Lagos-Ibadan Expressway. He said when the answer to his prayer came from God, it was in the form of questions: Do you believe there is God? ; Do you believe Jesus is the son of God? ; Do you believe Jesus died and rose from the dead? ; and Do you believe Jesus is coming back? After answering all the questions in the affirmative, Adeboye said God told him to put his faith to work. The Pastor, who is now known for Signs, Wonders and Miracles, said he once had little faith and some of his early miracles surprised him. According to a testimony he shares often, when a child he had healed spoke for the first time, he nearly jumped out of the window. Adeboye said: “Those who want to experience a harvest of miracles are those who are ready to put their faith to work. “It is faith that brings about miracles. “There was a time in my ministerial life when I had little faith. “But God honoured my faith. “A woman brought her child, who had never spoken since the day she was born, to me. “I therefore decided to pray for the child. Today, even handkerchiefs Pastor Adeboye anoints are used by people to heal the sick and even raise the dead. 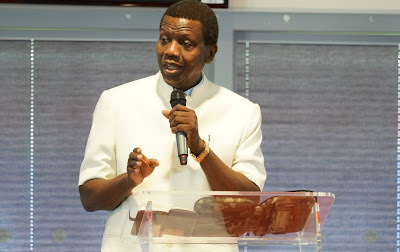 Preaching on the second day of the Congress, which was devoted to healing, Pastor Adeboye encouraged the congregation to exercise their faith once they are sure they are connected to God, the source of power. The theme of his message was: “The Branch,” from the statement of Jesus Christ that He is the Vine and we are the branch. He explained that Jesus, the Vine, is a combination of divinity and humanity – 100 per cent God, and when He was on earth 100 per cent humanity. Adeboye said: “Just as we are the branches of Jesus (the Vine), there is the humanity and the Divinity aspect of our lives. “But even at that, we must understand that we (the branches) cannot do anything without the Vine. The General Overseer explained: “The One who is in the Vine, is the One who is in the branches. With that, Adeboye challenged the congregation to begin to exercise their faith by healing the sick. He however cautioned that the only criterion to perform miracles with the Vine is if we are connected as a branch. At that point he made an altar call, which was responded to by many people, and closed the day with congregational prayers on healing. Other men of God who preached included are Pastor J. T. Kalejaiye and Dr. Okey Onuzo. • Father, everything that is not of you in my system, let your blood consume them tonight. • Father, let your Spirit, quicken the body of my neighbour right now. • Father we are in one accord, in your church let there be no more cancer. • Father, from now on when I lay my hands on the sick, let them recover instantly. • Lay your two hands upon your head and command healing upon yourself.